Britain’s changeable weather conditions demand products that can perform in all seasons. But it is in winter, when temperatures drop, that thermally efficient solutions are of a particular note. PHPD discovers how Garador’s Thermoframe can boost the thermal efficiency of a new home. With home buyers looking to maximise space, storage and enjoy the benefits of off-street parking, new homes often feature a garage. With many integrated within the overall footprint of a property, it is important to consider how these spaces are insulated. Garador’s Premium sectional garage doors are 42mm thick, filled with PU insulating foam, which helps to keep garages warm – especially with all the recent snowy weather. But for those looking for even greater insulation from their garage door, the company also offers the option of a ThermoFrame. The Thermoframe delivers greater thermal insulation, due to thermal break between the frame and the brickwork, providing up to 15% improved insulation. It is available as an option for all Garador sectional garage doors. For homes with an integral garage adjoining the house, and for garages which are used for activities such as a workshop, gym or for equipment storage, this extra protection can make a massive difference and help to reduce energy bills. Other advantages from Garador’s Sectional Garage Doors stem from the way they open: the door rises vertically and then runs back into the garage on tracks. This ensures there is no loss of driveway space in front of the garage – an important factor for many modern homes. They also provide a full opening drive through width, giving extra room for wider vehicles such as 4x4s and MPVs. 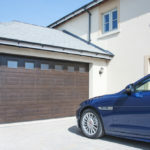 With Britain’s changeable weather, and with the value of the contents of garages steadily increasing, it makes more sense that ever to ensure the best insulation on a modern garage door.